The MS3 chamber design is based on our BSC2 chamber and allows interface methods of slice maintenance at room temperature on a compound microscope stage. Coverslip glass base allows for high quality optical imaging with normal condenser optics. 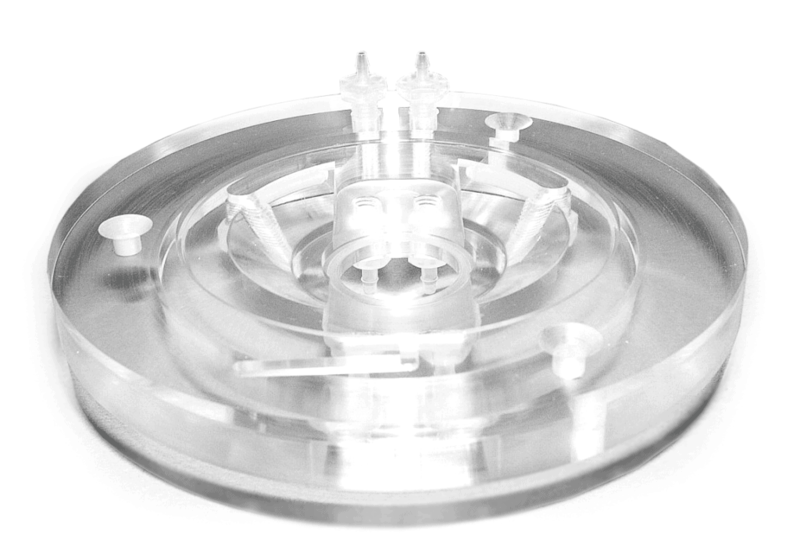 The MS3 chamber is constructed from clear acrylic having a diameter of 100mm, height is 20mm. It is normally arranged on the microscope stage with an adaptor plate to allow the optical base of the chamber to be in close proximity to the microscope condenser optics for optimal visualization. The slices rest in flat channel which has a central coverslip base 20mm in diameter. By placing various types of templates which have an inlet and exit well for perfusion solution, fluid flows in a narrow diamond shaped channel above the coverslip base whilst a high oxygen tension is maintained above it. The slices normally rest on a piece of lens tissue while being perfused from one end of the insert. Perfusion solution height is adjusted at the exit well to maintain interface mode. This is done by arranging lens tissue to wick solution into the exit well where it is removed by a tube attached to a suction line / peristaltic pump system. The pre-moistened carbogen gas enters from two inlets at the bottom of the chamber and is then deflected by a profiled acrylic lid on to the surface of the interface slice preparation resting in the central area of the glass coverslip. At the exit well perfusion solution can be collected for re-circulation or analysis. The half circle profiled acrylic lid allows access for stimulating and recording electrodes. Provision is made for a reference electrode wire to enter the proximity of the insert. H. Glass coverslip base and resting place for slices where humidified carbogen gas is directed by lid [A] in direction shown by arrows [I].